In 1630 Lord Leicester leased former commonland here to build Leicester House but was required to lay out public walks on the remaining part. Initially called Leicester Fields, the central areas were fenced and it was planted in c.1720-25. A statue of George I stood in the centre from 1748, but removed following vandalism in 1871 by which time Leicester Square was a less prestigious neighbourhood. In 1874 Albert Grant MP purchased and presented the newly laid out garden to the MBW, having erected a Shakespeare memorial fountain in the centre. In the C20th Leicester Square was progressively rebuilt, becoming the centre of the entertainment industry. The gardens inevitably suffered by heavy use, and were re-landscaped in c.1993, when the statues and fountain were restored although a prominent theatre ticket booth was erected. 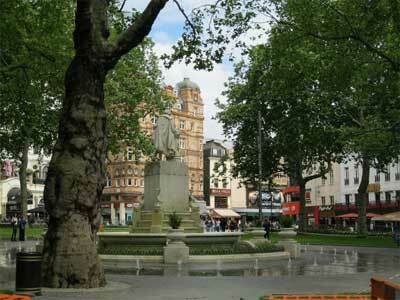 Since 2008, Leicester Square has been re-landscaped, re-opening in May 2012 in time for the Queen's Diamond Jubilee. Tube: Leicester Square (Piccadilly, Northern); Piccadilly (Bakerloo, Piccadilly). The land here was commonland that was first partially enclosed by the Military Company in 1616 for an exercise yard. When Robert Sidney, Lord Leicester, leased land in the parish of St Martin in the Fields to build his private residence, Leicester House, he initially enclosed the former commonland. However, following an appeal by local people to Charles I, he was required to keep a section public for the parishioners' use. As a result Lord Leicester pledged to improve the remainder of his leasehold 'into Walkes and planted with trees alonge the walkes, and fitt spaces left for the Inhabitantes to drye their Clothes there as they were wont, and to have free use of the place, but not to despasture it, and all the foote wayes through that Close to bee used as now they are'. This was initially known as Leicester Fields. The central areas of the Fields were enclosed with 'pallisadoes and fence', and were planted in c.1720-25. In 1748 Burchard's statue of George I was placed in the centre of square, but it was vandalised in 1866 and then sold in 1871. Leicester House was demolished in the 1790s and by 1851 the buildings around the square had deteriorated in prestige. The garden became the site of a temporary exhibition, 'The Great Globe', and was surrounded by advertising hoardings. In 1874 the freehold of Leicester Square Garden was purchased by Albert Grant MP who laid out the gardens anew, erecting a memorial fountain designed by James Knowles surmounted by a statue of Shakespeare. At the four corners of the fountain are marble busts of famous residents, the artist William Hogarth, the surgeon John Hunter, scientist Sir Isaac Newton and painter and President of the Royal Academy, Sir Joshua Reynolds. The square was presented to the Metropolitan Board of Works by Grant in that year, later transferring to the new London County Council, and now maintained by WCC. In the C20th as the square was progressively rebuilt and given over to cinemas and the entertainment industry, the gardens have inevitably suffered. In the 1980s Leicester Square was pedestrianised and a fibreglass statue of Charlie Chaplin was unveiled in 1981. The square was totally 're-presented' in c.1993 in consequence of the electricity generating plant that was built beneath the northern portion. The statues and fountain were restored and replaced but at the same time much intrusive hard landscaping was introduced. A prominent theatre ticket booth with 'fancy' brickwork and roof was erected on the southern boundary of the gardens at this time. The gardens had bedding displays and was shaded by its mature London plane trees. In 2008, WCC working in partnership with the Heart of London Business Alliance, approved a new scheme to redesign Leicester Square, the gardens and surrounding streets following public consultation. The phased programme commenced in 2010 and has now been completed to coincide with the Queen's Diamond Jubilee and the 2012 Olympics and Paralympics Games. The design by architects Burns + Nice includes extensive new granite paving across the square, gardens and side streets with a white granite ribbon on the perimeter of the square to create more seating, re-landscaping of the gardens, and a new water feature that uses recycled water to send jets two metres into the air surrounding the Shakespeare statue.